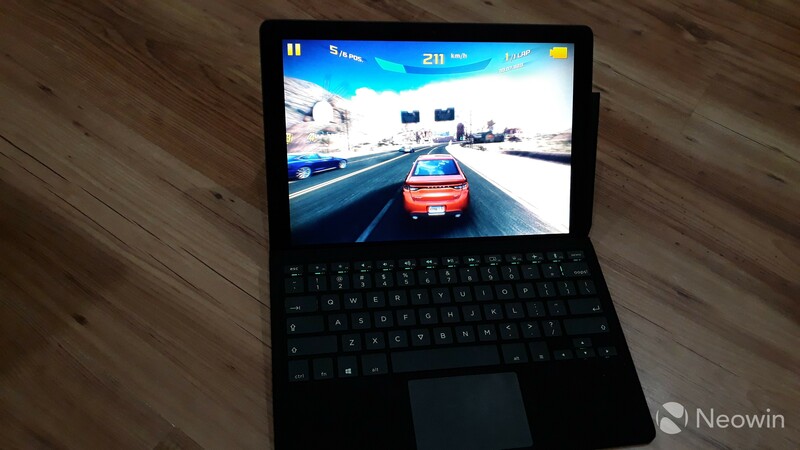 Eve V review: Surface killer or bust? 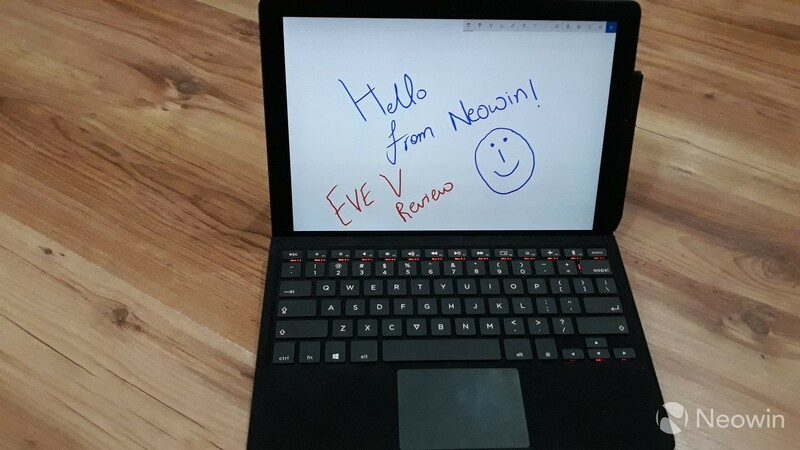 Back in 2015, Finnish company Eve entered the electronics market with its Windows 8 T1 tablet. 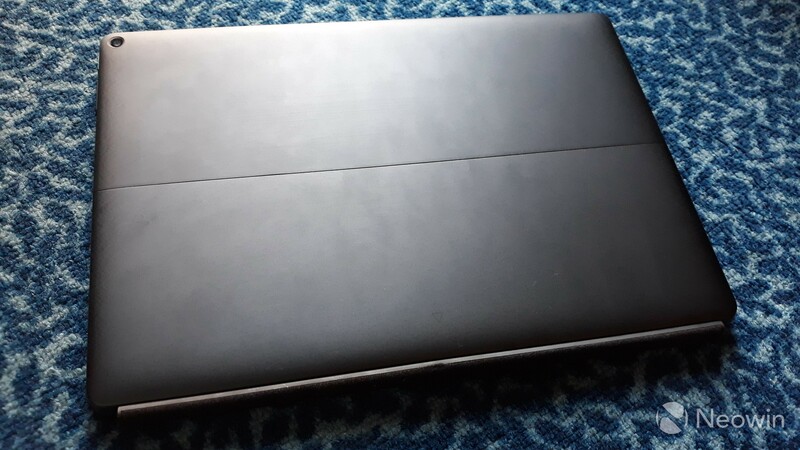 We reviewed the device and gave it a favorable review, praising it for offering respectable specs at an affordable price. 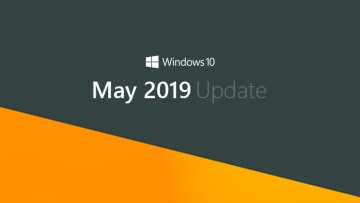 In 2016, boosted by its success with the Eve T1, the company announced that it was working on a Windows 10 2-in-1 device, codenamed "Pyramid Flipper". 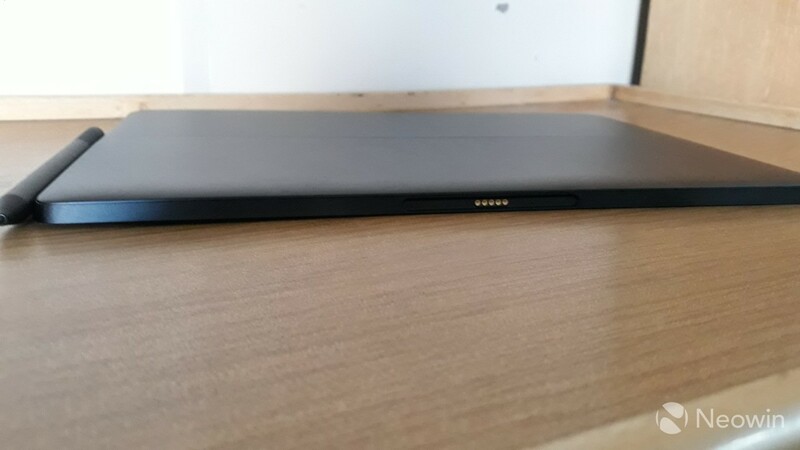 Intrigued by the mysterious device, I interviewed Eve's CEO and co-founder Konstantinos Karatsevidis, who jokingly described the hybrid device to me as the "Surface killer". 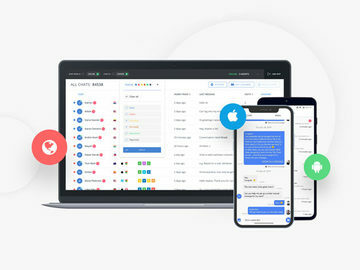 Over the next few months, Eve worked with its dedicated community - which at that time was over 1,000-member strong - to "crowd-develop" the machine. Together, the company and the community decided the final specifications and design of the upcoming device, and launched it on Indiegogo in November 2016, where it beat its $75,000 funding goal in less than an hour. Fast-forward one year, and we have the final device - the first crowd-developed computer - in our hands, now dubbed "Eve V", and with better specifications than those originally decided, ready to challenge a rather fierce competition. As can be seen from the specifications, the Eve V offers quite a lot at a very competitive price. 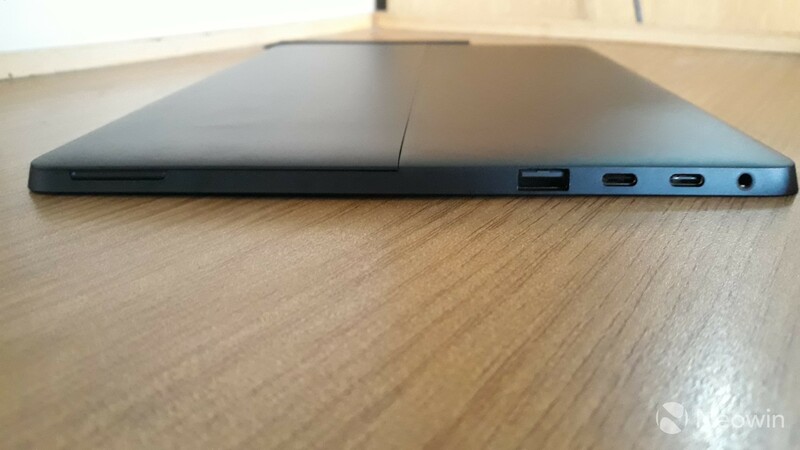 It contains a variety of ports and I was very pleased to see that two of those were USB-C. 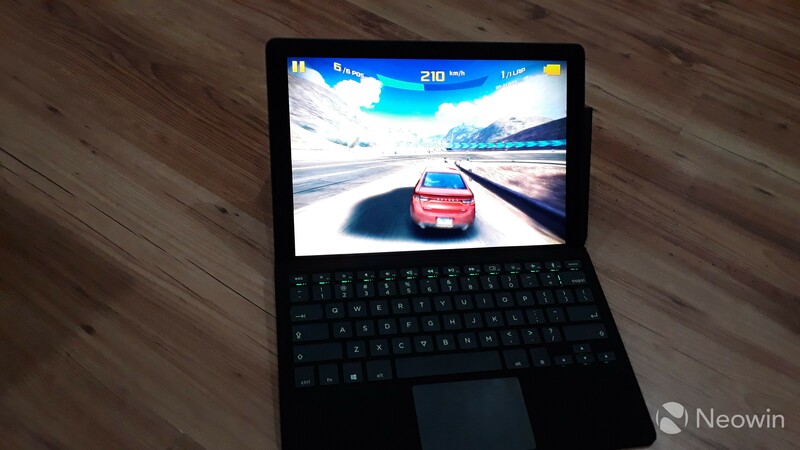 The display resolution is quite high, the battery is bigger than that offered by most devices, and the inclusion of the pen and a Bluetooth keyboard in the $1599 price tag is quite amazing. 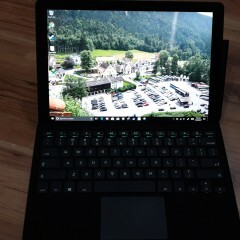 It is important to note that you can also use a Surface Pro pen with the Eve V.
It's interesting that Eve opted for Intel's Y-series processors instead of the conventional U-series present in convertibles and notebooks in the current range, but the company has told me that this decision was made based on the former being more efficient and requiring less power. Perhaps the most standard of the specifications is the camera, which is quite out-of-the-ordinary, given that this is a crowd-developed device, and in the lust for the highest specifications, the community could have chosen better cameras. 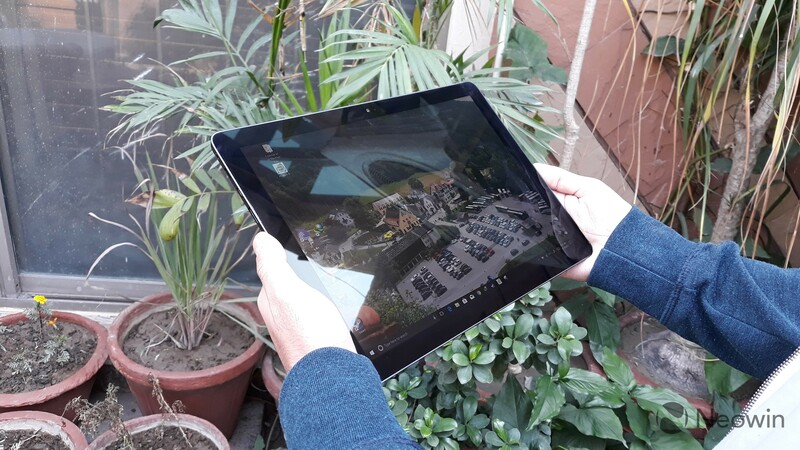 However, sacrificing camera quality for price (among other factors) is an understandable and wise decision, because let's face it, rarely anyone relies on a relatively hefty tablet to snap photos nowadays. 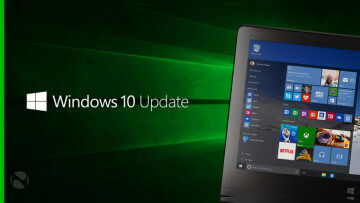 Eve also prides itself on the fact that the Windows 10 operating system running on the V is as it should be, that is, without any bloatware. That's something that I immediately found admirable, seeing that other vendors tend to bloat their devices with all sorts of software and programs that will be useless for most customers. The Eve V is constructed from aluminum, unlike the Surface series' magnesium. 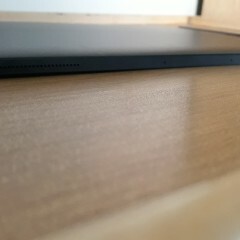 It comes in one color only, that is bluish-black, and I have to say, it looks extremely slick and feels very premium. 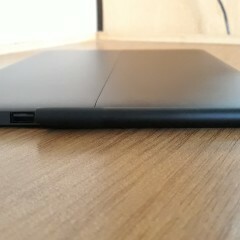 The back of the device features an integrated kickstand, that can be inclined up to 130 degrees. The kickstand also sports a small inverted triangle, which is the logo of the company. I like the fact that the logo isn't too prominent and blends in well with the black color of the device. On the right side of the device, you can see two buttons. The bottom one is the volume rocker while the one on the top is the power button, which also has a fingerprint scanner embedded. During my use of the device, Windows Hello via the fingerprint scanner worked quite well most of the time, and was quite reliable and fast. 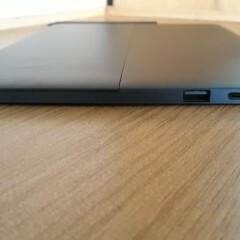 One of the USB-A ports is on the right side of the device - I mostly used this one to connect my mouse. Most of the bottom half on this side is magnetic so that you can attach the pen to it. Although this is well-positioned in the way that it doesn't obstruct the USB port when the pen is magnetically attached to the side, I do feel as if the inclusion of a pen loop would have been decent too. Don't get me wrong, the pen attaches to the side quite firmly when the V is stationary, it does feel slightly shaky when I carried the device around. So far, the pen hasn't fallen off unexpectedly during my usage of the Eve V, but when I shook the machine slightly just to test the stickiness of the pen, it did fall off rather quickly. To be clear, you can also use the pen's clip to attach it with the front end of the keyboard (near the pogo pin slot), and it works perfectly fine if you're carrying the device with the keyboard closed on top, but feels very awkward if you're actively using the V. There's also this off chance that the clip might loosen or break if it's frequently tugged in and out of the keyboard. Eve has informed me that it will have accessories for the Eve V available on its webstore soon, so hopefully this minor issue can be easily remedied. 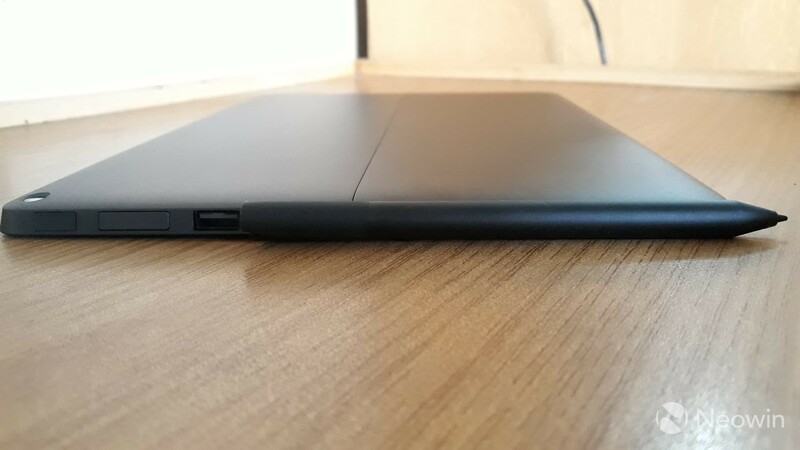 On the left side of the device are two USB-C ports, one of which features the Thunderbolt 3 standard. This can also be used to power two 4K monitors at once, or a single 5K monitor. Both ports can be used to charge the Eve V, but not at the same time. I really think that having USB-C ports is a huge plus, especially for charging, as it removes the need for proprietary charges for each of your device. As it currently stands with the Eve V, you can power monitors with one USB-C Thunderbolt 3 port, and charge it with the other one. Below the two USB-C ports, you'll notice your standard USB-A port - the second one in the V - and the 3.5mm headset jack, which also packs an audio amplifier by Texas Instruments. The machine features two far-field noise-canceling microphones, which are quite decent for Skype calls and other similar tasks. I'm not really a fan of Cortana so my testing doesn't include extensive usage of Microsoft's digital assistant, but the mics did work well for during my limited operations. On the top of the V, you'll find the device's quad speakers. Although these aren't something to write home about, there's nothing wrong with them either. They're loud and clear, without the tinny annoying sound present in some devices. The placement of these speakers is nice too, unless you're using the device in portrait mode - which I never felt the need to - these speakers won't be obstructed in any way. The bottom of the device features a pogo pin slot that can be used to connect the keyboard. The magnet used here is quite strong and attaches the keyboard firmly with a snap. 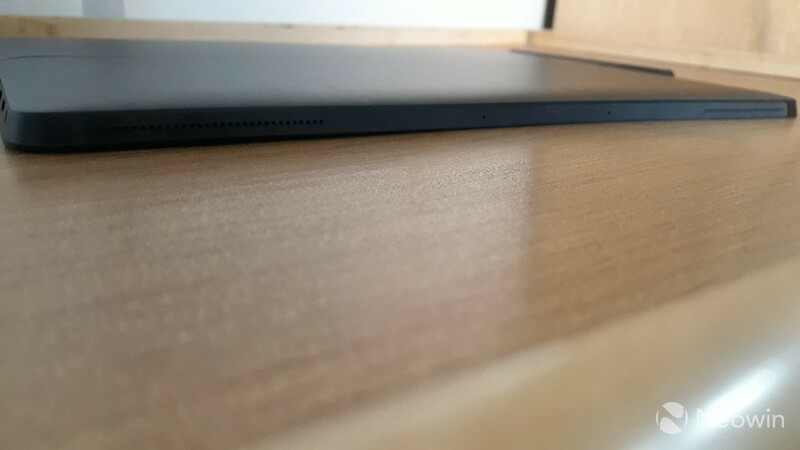 The keyboard can also be moved one level above its rested state, due to which it attaches magnetically to the bottom bezel of the device too, blending in well with the black bezels, and not obscuring the bottom part of the screen. 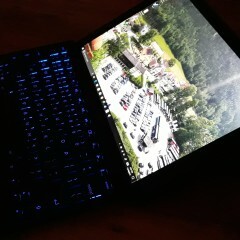 Together with the keyboard attached, the Eve V weighs in just under 1.5kg, which feels exactly right for the device. It isn't too heavy and can be easily carried around. 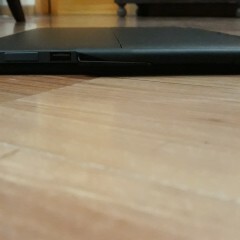 The weight is well-balanced across the interior of the Eve V.
What bothered me in the otherwise great design was the fact that there's no charging LED, which is something that I'm used to on my Dell laptop. There were times when the charger was not plugged into the wall socket properly and the device was on sleep, and I didn't realize that it wasn't charging. The only way to check if the machine is charging correctly is to turn it on and check the battery indicator icon in Windows 10, a process which I found to be slightly tedious. That said, this is more of a matter of personal preference rather than an actual flaw so not everyone will find this as cumbersome as I did. There's only one word to describe the 12.3-inch IGZO LCD display of the Eve V: gorgeous. 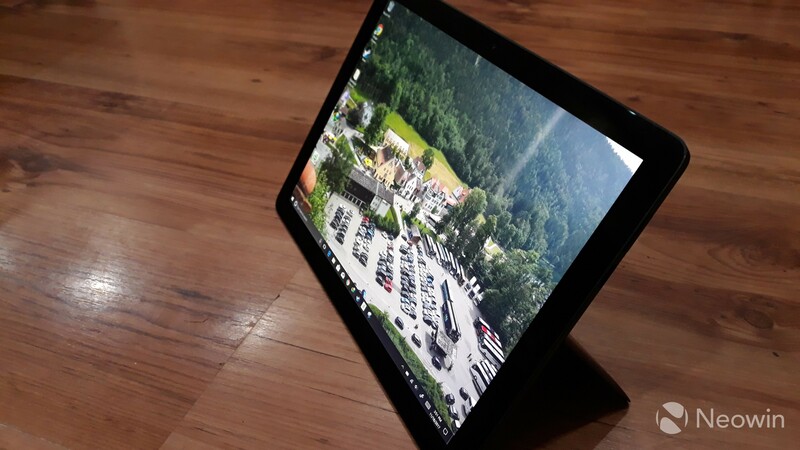 It's not an edge-to-edge display, which, in my opinion, wouldn't make much sense in a device that can be used as a traditional tablet in both hands. Instead, it sports bezels of equal thickness on all four edges of the device, giving it a nice and uniform feel. 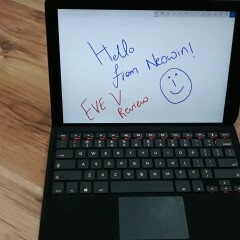 Coming back to the actual display of the Eve V, it's simply fantastic. I'm not used to a 3:2 aspect ratio as I mostly work on my laptop, which features a 16:9 aspect ratio. However, the V's display worked well for most of my work, which includes writing, coding, browsing, playing games, and watching movies. 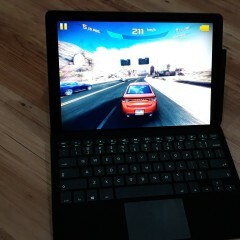 There's no noticeable pixelation, and with the 3:2 aspect ratio, Surface fans will feel right at home. The screen is super-bright too. I had no trouble using it at 50% brightness outdoors and there were no problems with the viewing angles, which are great too. 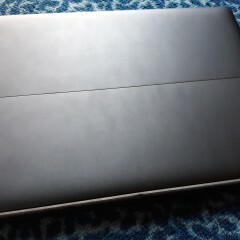 If you use your devices in transit, you'll have no issues at all with the display of the Eve V.
I mostly utilized the V's display as I do with my laptop, but even when I used it with my fingers, there were no noticeable smudges or fingerprints, likely because of the anti-fingerprint coating. Eve boasts that it is the only company that individually and manually calibrates the display of every unit, and seriously, the quality and effort shows. 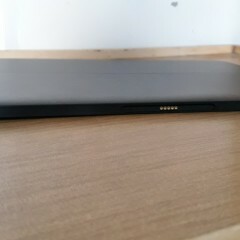 The Eve V comes with a Bluetooth keyboard with an Alcantara base and casing, similar to the one that Microsoft offers. The keyboard sports plastic keys that make a noticeable clicking sound when used. I know some people hate them and some don't, but as for myself, I'm quite impartial to both, so the keys didn't bother me at all. What really bothers me about a keyboard is the layout, since I'm used to my own, however, in the V's case, I'm pleased to say that I quickly grew accustomed to it. The most noticeable features of the keyboard are that the "V" key has been altered to now sport Eve's logo, and the backspace key has "oops!" written on it. Although I'm not a fan of the latter, the slick logo is certainly a nice touch and gives the device a more personal feel. Regarding the "oops!" key, it stands out rather prominently, which isn't something that I'm looking for in tech devices that I own (I chose to purchase a Gear S3 Classic smartwatch over the competition simply because it looked like a standard circular watch). However, since I rarely look at the keyboard when I'm typing, I wasn't too bothered with the alteration. 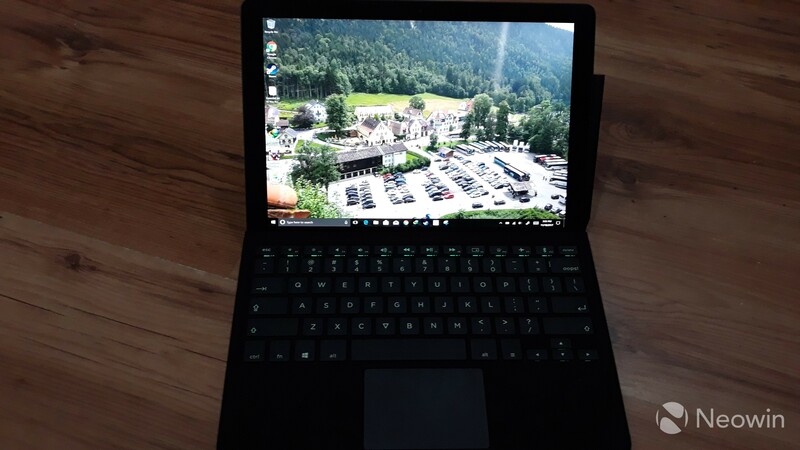 Most people have reservations regarding the use of Alcantara in Surface Type Covers due to its tendency to get dirty quite easily, but I think that the fabric gives the keyboard a premium look and feel, enhancing the overall user experience. Any dirt that the casing gathered during my usage of the Eve V was easily wiped away with a dry cloth. That said, I have only used the V for a week, so it obviously hasn't gone through significant wear and tear. 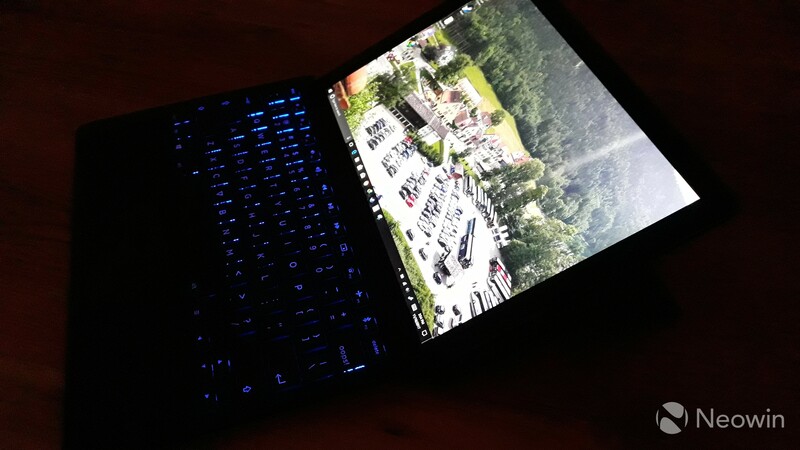 The trackpad on the keyboard is covered by glass, which gives it a nice look, especially when it reflects what is being shown on the screen, I do have some minor complaints with it. It generally works well, but when I tap on it to click (instead of pressing upon the bottom half), it responds nine out of ten times. Now, 90% responsiveness may sound like a great ratio, but that one time out of ten that it doesn't register my tap feels very annoying and interrupts my workflow. 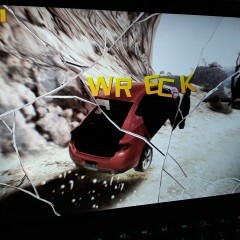 I tried increasing the sensitivity but to no avail. In the end, I had to resort to the traditional clicking or using my external mouse, which again slightly diminished the otherwise great user experience. 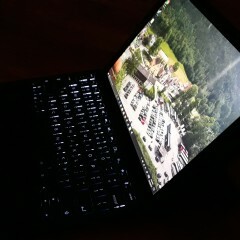 But perhaps my favorite thing about the keyboard is that it's backlit. 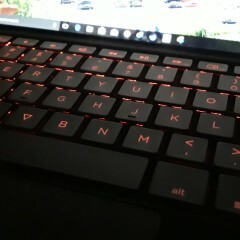 The keys look very impressive, especially in reduced lighting. You can easily change the color using the "Fn + V" combination, which allows you to cycle through seven different colors including red, green, blue, purple, and more. 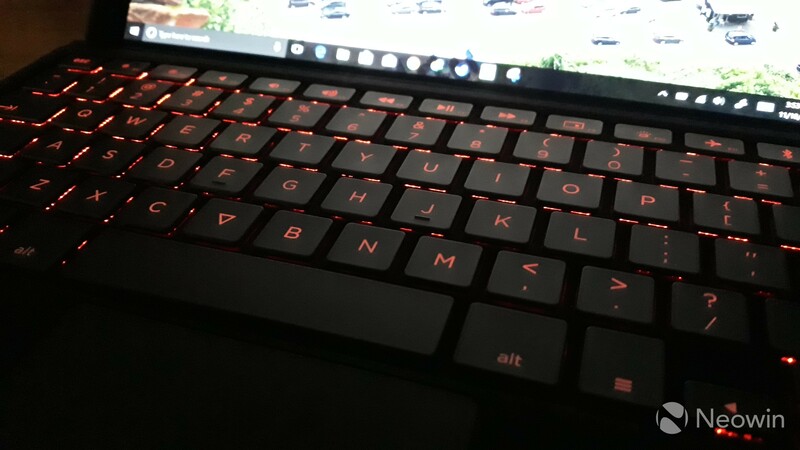 You can also utilize the F10 key to increase or decrease the brightness of the backlit keyboard, which comes in very handy depending on the lighting conditions in which you are using the device. 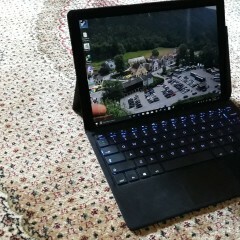 After attaching the keyboard, the device was extremely sturdy and lapable. 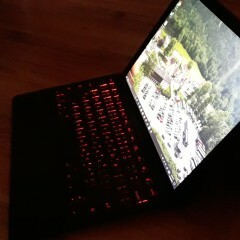 I had no trouble using it as a regular laptop - which is the form factor I utilized the most - and typed on it for hours on end, without even realizing that the V isn't a traditional laptop. The integrated kickstand was very stable, regardless of the position that I used it in. 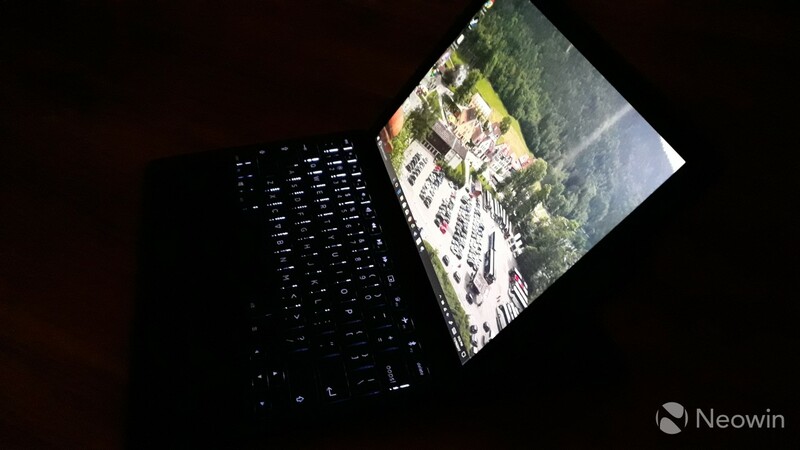 In fact, you can also detach the keyboard and use it via Bluetooth - it can connect with up to three devices. This isn't a use case that I preferred, but should offer an interesting option for some users. Coming to the Pen, it works quite well and simply glides across the screen with ease. It's responsive near the corners and there's only a slight period of latency which is easily ignorable during general use. 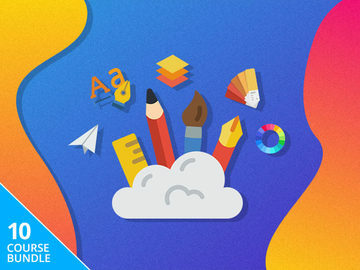 With the improvements in Windows Ink, there's a lot that you can do with the Pen, including using it for sketching, screenshots, note-taking, and general browsing. There are two buttons on the Pen, one is generally used as an eraser while the other plays the role of the right-click button of the mouse. Eve says that an application can program these buttons to perform different tasks, if a developer so wishes. Simply put, the battery life of the Eve V is fantastic. On 40% brightness and default settings, I easily managed to squeeze out almost nine hours of battery life, which is enough for my usual workday. Do keep in mind that my daily routine consists of writing, coding in Visual Studio and NetBeans, browsing, and watching movies, so your mileage may vary. Of course, if you want to get even more out of the Eve V, you can simply decrease the brightness, limit background apps, and turn on the battery saver present in Windows 10. 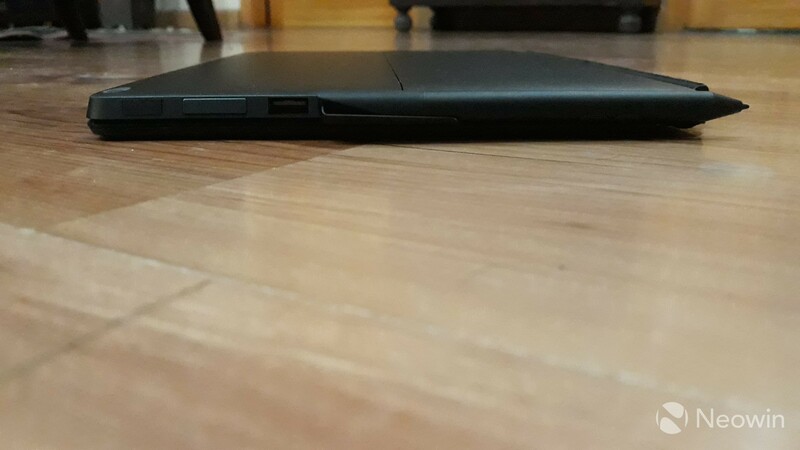 Eve told me that it could have made the V a millimeter thinner, however, the company decided against it (based on consumer feedback) in order to incorporate the larger 48Wh battery, which I have to say, is a very smart decision. I managed around three hours of battery life when playing Telltale Games' Guardians of the Galaxy (review coming soon!) on Steam, which is about what I expected on Intel HD Graphics. As mentioned before, the Eve utilizes its USB-C ports for charging, and charging from nil to 100% takes slightly over three hours. However, as I mentioned earlier, the device easily gets me through a full day's work, so I felt no problem in charging it overnight and then getting through the next day. 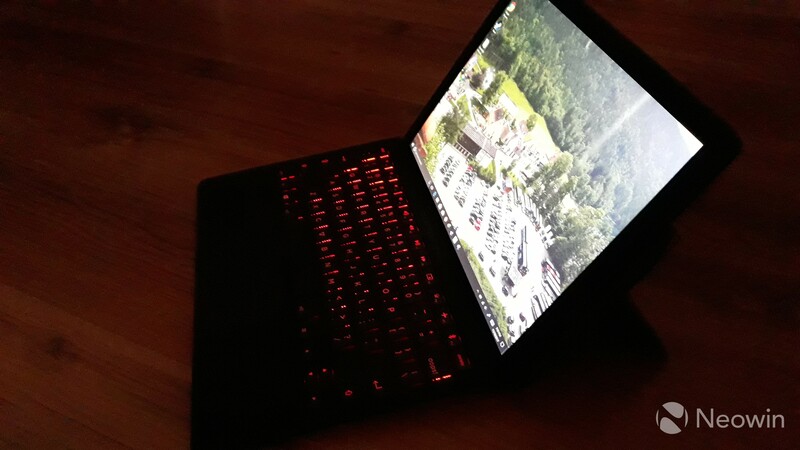 My Eve V review unit sports an Intel Core i7-7Y75 processor, other variants feature Core i5 and Core m3 processors. While the device felt extremely fluid in day-to-day usage and didn't lag, overheat, or stutter at all even with multiple applications open (Visual Studio, Google Chrome, Steam, Windows Explorer, and VLC Media Player, among others), it didn't exactly soar in benchmark tests. 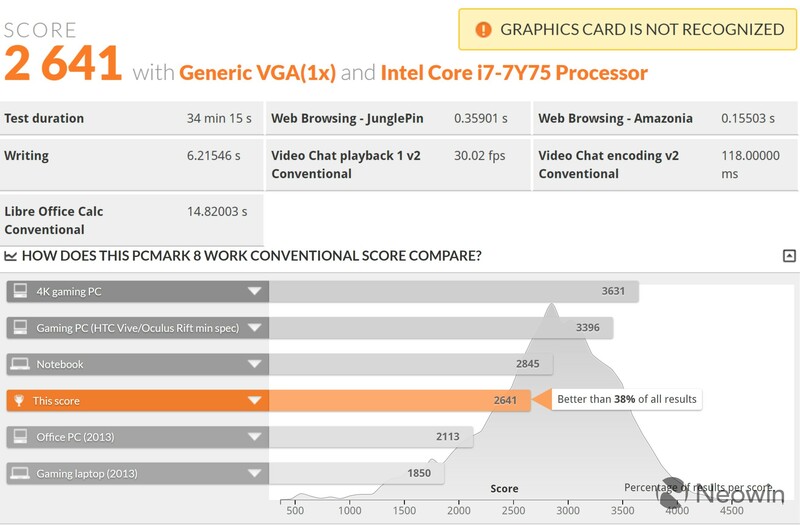 For benchmarks, I used PCMark 8, which offers three tests: Home, Creative, and Work. First up is Home, which checks in on normal tasks like web browsing, video chat, photo editing, and casual gaming. 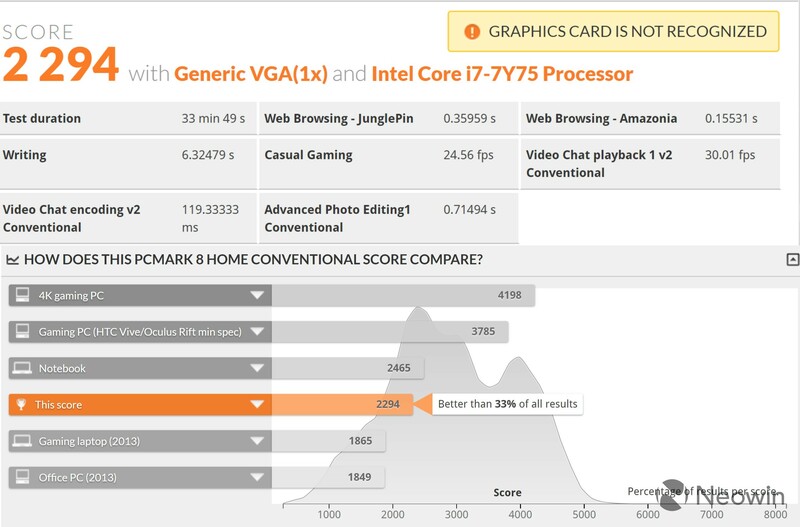 Note that this isn't a bad score, and is about what you'd expect from a Y-series Intel chip, even if it's a Core i7. Next up is the Creative test, which benchmarks video editing, media transcoding, advanced gaming, and more. This time, the V turned out to be better than 38% of the competition, which is respectable, although not entirely awe-inspiring. Lastly, I ran the Work test, which checks up on productivity-related tasks like writing, spreadsheets, video chat, and more. Once again, the Eve V managed to beat 38% of all other scores and while it's clear that the machine won't be blowing the competition out of the water, it certainly challenges other devices in its category. For my usage, the device worked extremely well, but once again, mileage may vary according to the resources required by the applications that a user is running. Moving on to gaming, the Eve V definitely won't be running high-end games such as Forza Motorsport 7, Gears of War 4, or Rise of the Tomb Raider, on an integrated Intel HD Graphics card, as you'd expect. 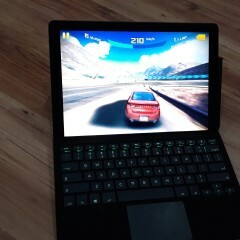 On the other hand, it runs relatively low-end Windows Store games such as Asphalt 8 with ease. However, it's important to note that the machine struggled to run Telltale's Guardians of the Galaxy on the lowest settings at the default 2880x1920 resolution, barely managing 20fps. I did get it up to 45fps when I toned the resolution down to 1920x1080 though, which is quite strange, given the low requirements of the title. Another drawback that I noticed with the trackpad during my gaming sessions is that it locks up if you're trying to move the cursor while simultaneously pressing a key. This essentially means that if you're using the WASD keys to move your character, you can't utilize your trackpad to navigate the camera angle, which is a major requirement in nearly all first-person and third-person games. I discussed this with Eve, and the company informed me that this isn't a bug but is actually intended behavior based on feedback from users who complain that their wrists sometimes unintentionally moves the cursor when they're typing. 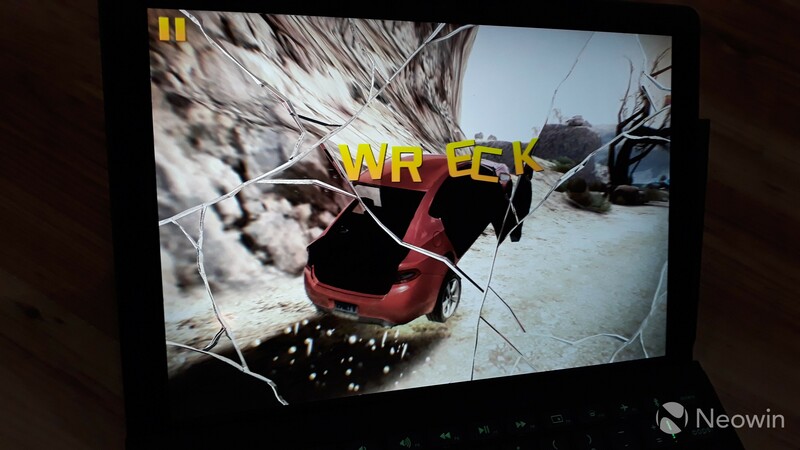 Fortunately enough, the company has also told me that the use case that I have described for gaming is also quite valid, and that it'll be pushing driver updates providing options for both categories of users soon. Although I unfortunately don't have an eGPU to fully test out the V's gaming capabilities via the Thunderbolt 3 port, Eve claims that its hybrid machine can easily run DOOM 3 and Wolfenstein II at 50-60fps on high settings. You can find empirical evidence on YouTube here. So, if you're looking for a 2-in-1 that will solely allow you to play high-end games, it's hard to recommend the Eve V, unless you have an eGPU - in which case, full steam ahead! 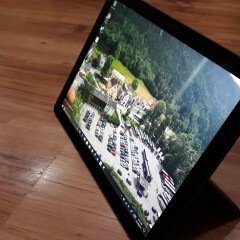 All in all, the Eve V is a fantastic device that you really should consider if you're in the market for a tablet, a laptop, or a 2-in-1. 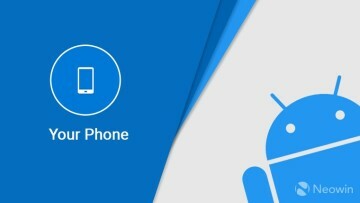 What could have easily turned out to be vaporware and a complete disaster based on contrasting user feedback has turned out to be a machine that offers better specifications and user experience than most competing devices, and at a lower price tag. Whether you're an artist, a developer, a writer, or a general user, the Eve V has enough juice to meet most of your needs. It offers a fluid user experience without any of the bloatware often included by most other vendors. The combination of ports is decent, and the inclusion of the N-trig Pen and keyboard in the price is even more impressive. The display is mouth-watering and offers some great visuals, which is something that has become very important in devices nowadays. Most importantly, the few missteps with the device can easily be remedied with driver updates. 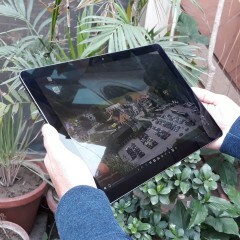 While the Eve V defeats most of the competition in terms of specifications, at the end of the day, whether the company's hybrid device is a Surface killer or not depends upon the perspective and the preference of the customer. 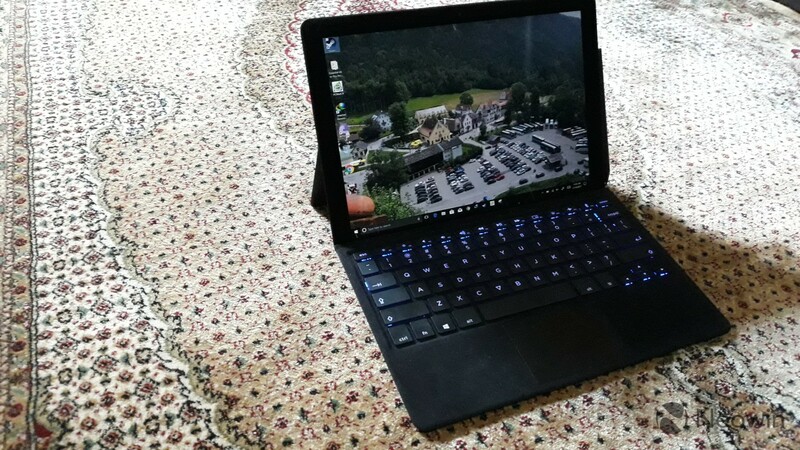 As for myself, the Eve V has completely killed my desire and thirst for a Surface device, and firmly positioned itself as one of the best devices that I have ever used. If you weren't able to purchase the Eve V during the Indiegogo campaign, you will have another chance to do so during the company's flash sale on its webstore on December 4, 2017. 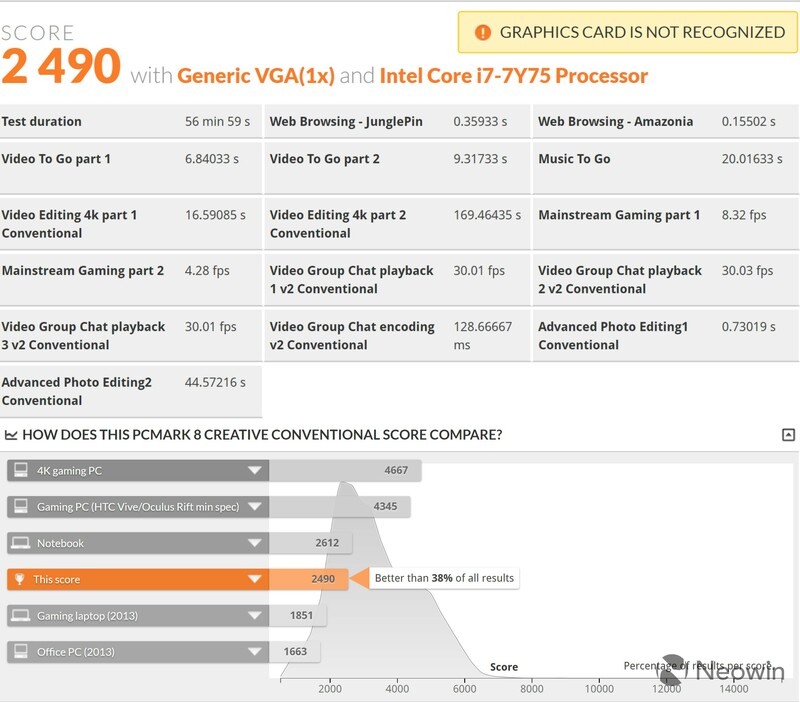 Note: The Eve V unit was provided to the reviewer by Eve.